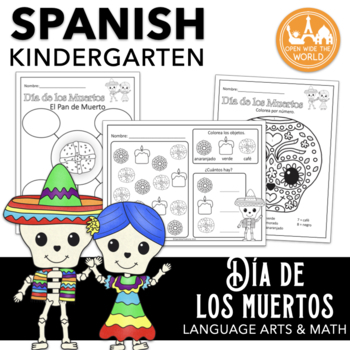 Día de los Muertos - Day of the Dead SPANISH Dual Language Immersion Kindergarten Mini-Pack. No English on student pages! 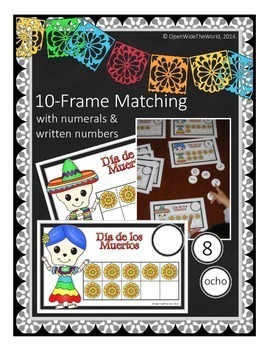 10-frame matching activity: students match the "cempasúchil" (Mexican marigolds) 10-frames to numerals or written numbers. Alternatively, they may write in the answer with a dry-erase marker. Color by number "calavera" (sugar skull) page, covering Spanish vocabulary for: red, orange, yellow, green, blue, purple, brown, black. 2 bubble maps: "las calacas" and "el pan de muerto"
Features a repetitive sentence structure with two early sight words, "Yo veo..."
Students color 6 vocabulary pages (plus a super cute cover), cut out target Día de los Muertos vocabulary words, then match the cut-outs to gray-line vocabulary in the mini-book. When done, read aloud with friends! NOTE: if you purchased this packet prior to Aug, 2014, please go to your "my purchases" page and re-download to access the new content! Would you like MORE fun seasonal Spanish practice for your kindergarteners? Check out my Spanish Kindergarten Thanksgiving pack, too! 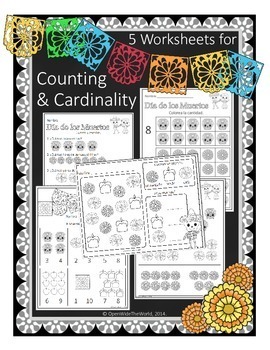 And for more Día de los Muertos fun, check out my BILINGUAL Día de los Muertos Activity Pack! Your feedback is greatly appreciated, and REWARDED! Thank you for leaving a comment.